1816 - After the War of 1812, skilled trades, or “journeymen”, and workmen are recorded as meeting in secret meetings or “combinations” in Halifax, NS. 1832 - Toronto Typographical Union first organized, which would later become Local 91 of the International Typographical Union. The Toronto group first comes together under the slogan, “United to support, not to injure,” and their efforts are supported by William Lyon Mackenzie. 1834 - A carpenters’ association is created in Yarmouth, NS, and lasts until 1851. 1850s - Starting in the 1850s, the Labourers’ Benevolent Association rules shipping ports “with rod and iron,” and shuts down shipping operations to attend funerals whenever a member dies on duty. 1852 - Journeymen Tailors’ Operative Society is formed in Toronto. 1867 - Knights of St. Crispin, an early international effort involving Canada and the United States, forms to regulate machinery, and the process of shoemaking in particular, after the massive production needs of the US Civil War (for army boots) led to the destruction of proud old crafts. 1872 – A Nine Hour League is formed in Hamilton, Ontario, joining earlier movements in the United Kingdom and the United States for a nine-hour work day. Prior to this movement, the workday was unregulated, and people stayed at work until the boss said they could go home. 1872 - Canada’s first union federation is attempted in Toronto with the creation of the Canadian Labour Union (CLU), but the effort is short-lived, lasting only six years until 1878. 1872 - Canada’s first prime minister, Sir John A. Macdonald, rams through the passage of the Trade Unions Act, which abolishes the practices of charging union meeting organizers with “conspiracy” against the state, but, at the same time, demands that people must “register” in order to be protected by the Act. Nobody registers, and the Act effectively becomes a dead letter. 1877 – Despite Macdonald’s seemingly progressive Trade Unions Act, “master and servant” laws still exist in Canada until 1877 (and arguably later), which allow the courts to send “disobedient” or absentee workers to jail at the boss’s request. 1881 – A worker in an Ontario knitting mill earns a total of $7.75 for an entire 59-hour work week. Women and children work for just as long for $1.65 per week. 1881 - First Knights of Labor assembly convenes in Hamilton, Ontario, Canada. 1883 – Canada’s second try at a federation, or central labour body, is attempted with the creation of the Trades and Labour Congress of Canada (TLC), established by the Toronto Trades and Labour Council and the Knights of Labor. 1886 - Journeymen Barbers Protective Union, the Journeymen Cigar Makers' International Union (CMIU), and other UFCW predecessor unions present at founding convention of American Federation of Labor (AFL), an amalgamation of dozens of separate craft unions. 1887 - Journeymen Barbers International Union of America founded. 1888 - Clothing, Gents Furnishings and Shoe Store Workers receive AFL charter. 1888 - Mary Burke elected first female Vice President of the Retail Clerks National Protective Association. 1890 - Establishment of Clothing Cutters’ Progressive Union. 1890 - Retail Clerks National Protective Association gets AFL charter, after retail workers, a couple of year earlier, started organizing around “Early Closings” and “Holiday Closing Provisions” campaigns. 1891 - United Garment Workers of America chartered by AFL. 1895 - Boot and Shoe Workers Union (BSWU) receives AFL charter. 1897 - Amalgamated Meat Cutters and Butcher Workmen of North America (AMCBW) receives AFL charter, after Samuel Gompers organizes a meeting of independent butchers’ unions, primarily from New York state, 1896. 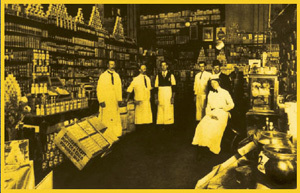 1899 - First Canadian local of Retail Clerks founded in Vancouver, British Columbia, later to become UFCW Local 1518.